CPAP is an acronym for Continuous Positive Airway Pressure. CPAP provides positive pressure to artificially splint the airway open, so normal breathing can occur. CPAP does not supply extra oxygen, as it is sometimes confused with ventilation. CPAP increases the atmospheric pressure by means of the pump blowing air down a tube and through a mask which is worn by the patient. The mask must create an adequate seal and the mouth cannot have air escaping from it (this constitutes a leak), for the therapy to maintain a continuous pressure. What Condition is CPAP Treating? CPAP treats a common condition known as Obstructive Sleep Apnea (OSA). This disorder is a breathing disorder that occurs only while the subject is asleep. OSA is characterised by the narrowing of the throat by 50% (known as a hypopnea) or the complete obstruction causing the cessation of breathing (known as an Apnea). If both the hypopnea and apnea occur for more than 10 seconds a sleep study will record them. In severe cases the subject can experience these events as many as 60-80 times an hour. An event will usually cause a cortical (brain) arousal due to hypoxemia (not enough oxygen in the blood) and hypercapnea (too much carbon dioxide in the blood), which severely disrupts the cycle of sleep. The subject is usually completely unaware of these events, but awakes in the morning feeling unrefreshed, finding it difficult to rise out of bed and function during the day. OSA can cause excessive daytime sleepiness, mood swings, depressive type symptoms and many other comorbidities such as hypertension (high blood pressure), the risk of heart disease and stroke. OSA is also known to diminish the quality of life. What Type of CPAP’s Are There? These are units that are placed on a fixed pressure with a ramp function that builds the pressure over a specified time. These are units that are set with a minimum and maximum pressure. This type of unit measures breathing and provides the varying minimum pressure required to splint the airway. These are ventilators that provide pressure support rather than actually providing timed ventilation. It must be noted that a VPAP is for people who do not have lung disease, but have a condition known as CompSAS which is both OSA and Central Sleep Apnea (CSA). The latter condition is another sleep breathing disorder where the airway is opened but the respiratory neurons delay breathing. CSA can be seen in heart failure and stroke affected patients. Some CPAP units require buttons to be pressed to operate, while others can turn on as soon as the patient breathes into the mask. Most CPAP units have a humidifier attached which provides moisture to enable CPAP to be tolerated easier. A humidifier has water inside that is heated and the patient breathes in the vapour. The water level should be checked daily. Without humidity, the air dries and it can be very uncomfortable causing some nasal conditions. The water chamber should be washed 1-3 times a week with warm soapy water. It is very important the unit is not moved if the humidifier is still attached, or the humidifier chamber has not been removed. The water inside the humidifier can make its way into the CPAP unit where it can do severe damage causing the unit to become inoperable and leading to expensive repair. CPAP should be seen as medication and treated as such. It is required to be used every time the patient sleeps. Sedatives and post-operative care can increase the severity of OSA; therefore CPAP use is very important if a patient needs to spend time in hospital for an unrelated CPAP condition. The mask is an integral part of CPAP therapy and it must have a degree of comfort. Most masks have clips attached to the side. Identify these clips and use only the clips to remove the mask. The tension of the mask will affect the seal and comfort of a mask. It may take several weeks to achieve ‘just the right tension’ for compliant use. Sleep Assist Pty Ltd will demonstrate how the mask is applied and cleaned. The silicon part of the mask requires to be cleaned daily. There are three types of masks; nasal, nasal pillow and full face. 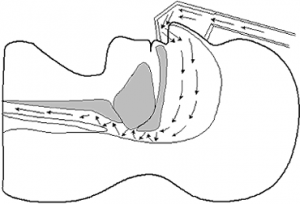 The nasal and nasal pillow masks deliver air and pressurise the airway via the nose. The mouth will usually remain closed during sleep. The full face mask will deliver air and pressurise the airway via the nose or mouth. All masks have a bias flow from where air escapes. This is engineered to flush out carbon dioxide during treatment. This is never to be blocked or diverted in anyway. If a patient requires oxygen, some masks have an oxygen port. It is important the silicon grommet covering the hole/holes is not discarded. Some masks have two oxygen ports. Only expose one of the ports by removing the silicon grommet, leaving the grommet connected to the other oxygen port. On many occasions, the grommets have been discarded, leaving the mask with a substantial leak which will affect efficacy of treatment and sleep due to excessive noise caused from the air escaping from the oxygen ports. If you are not sure about any part of CPAP, or are unsure how to apply the therapy, Sleep Assist Pty Ltd can be contacted to arrange a solution.